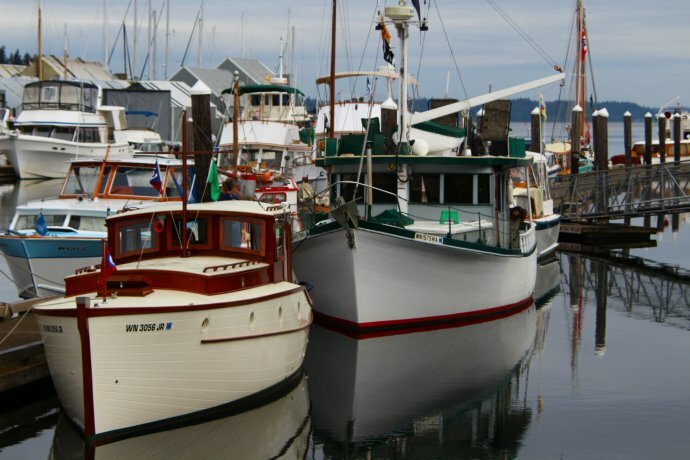 The Olympia Wooden Boat Association is proud to announce that the 40th Annual Olympia Wooden Boat Fair will be held Saturday and Sunday on Mother’s Day Weekend. The fair, a traditional community and family event, is free and open to the public on Saturday from 10 a.m. to 6 p.m. and Sunday from 11 a.m. to 5 p.m.
On display will be all types of wooden boats including power, sail, row boats, dinghies, kayaks, and canoes. An exciting addition to this year’s lineup of vessels is the Olympia Wooden Boat Fair’s featured boat, 30′ Bristol Channel cutter AMERICA, hand-built by Tom Crout of Puyallup (South Hill) over the course of 18 years. Come and enjoy the handmade artwork, pottery, wooden décor, jewelry, clothing, homemade food products, and many more nautical-related items from local artisans. When the family gets hungry, take a walk through the International Food Alley booths offering traditional burgers, seafood, international choices and tempting desserts. There will be a Children’s Boat-building booth on Saturday from 10 a.m. until 2 p.m., or while supplies last. The fair is also known for showcasing local musical entertainment starting at noon on Saturday. Information, directions, or boat and vendor information: association @ olywoodenboat.org.